Alberto here. Please forgive me for missing my Wednesday Walk last week. The humans were off somewhere celebrating this thing they call “Thanksgiving”. We had a great cat sitter so all was well at our house but truth be told, I’m a bit miffed that they didn’t bring us any of this “turkey” they keep talking about. Sometimes humans can be so selfish. But I digress. Here are my feline findings on the web this week. There are many kind humans who feed and care for feral cats. Sarah Shipton is one of those kind humans and when some of her feral friends were found dead or disappeared she decided that these felines needed a safe place. She took out a loan and built a sanctuary for the feral felines in her area. She installed a cat proof fence, insulated shack full of kitty toys and a safe place for the felines to sleep and stay out of the cold, a lawn dragon and a porch where humans can enjoy the kitty cavorting and lots more. The Catty Shack is a 501c3″ no-kill animal shelter in Hamel, IL and the bulk of the contributions they receive are used for testing, spaying and neutering and food. If there was an award for human rescuer of the year, I’d give it to Sarah Shipton. Two paws up for Catty Shack! While we’re on the subject of humans doing great things for felines, here’s another example. This mini-human named Kendall Keyes (who is only 9 years old) was concerned when she learned that the Palm Springs Animal Shelter needed warm fleece baby blankets for their adoptable kittens and cats. She sprang into action and with the help of her mom and school counselor, Kendalls Pawsitively Purrfect Kitten Supply Drive was born. So you see humans, you don’t have to big, old or famous to do something fantastic for the felines at your shelter! Our female human is a writer and happens to be writing a mystery that centers around animal forensics. I for one, thought she was a bit crazy until I stumbled upon this article. A woman accused of sending letter bombs to Texas Governor Abbott and former President Obama was recently arrested and indictes and some of the key pieces of evidence in the case…cat hairs! Evidently the Feds found cat hairs stuck under the address label on the letter and voila, the rest is history. So now I guess I owe our female human an apology, especially since I have it on good authority that there are two characters in the book that are exactly like Oliver and yours truly! Those of you who follow my Wednesday wanderings know how much I love stores about adventure cats (being an aspiring adventure cat myself). I’ve featured many but this story is about an adventure cat and his canine buddy. Henry, the dog and Baloo, the cat were both adopted from shelters and now that they have each other, their humans take them camping. These two have some amazing adventures and you can follow them on their Instagram account. Hmm, maybe I should speak to the humans about adopting an adventure buddy for me. Even world-famous media cats and adventure cats have their limit. Oscar, as his human desciribes him, is a “cat of the world” but there is one area of modern life that Oscar does not like and that is flying. Note his less then enthusiastic expression in his carrier. After you read all that the human had to go through before and during the trip and Oscar’s response, you’ll want to think twice about taking your feline on a flight, even if they are the most adventuresome of cats. Tucker here. You may have noticed that Alberto didn’t do his usual web walk yesterday. You see our humans decided to take some time off for the holiday and that means our purrsonal assistant was not available to assist him with the post. Now when you’re a feline, EVERY day is a holiday but the poor humans only have a few of these holiday thingys so I guess we need to extend them some grace. As the Alpha of the Tribe of Five, I felt it my duty to tell all of our readers and fellow feline and canine bloggers how thankful we are for you. We wish you a wonderful holiday and don’t forget to be thankful for your humans for giving you a forever home. I hope you enjoy my short video message below. Alberto here with my Wednesday wandering through the web. I hope you enjoy the feline finds! Once again, our friends across the “pond” prove that they are ahead of the curve when it comes to moggie care. The Shropshire Fire and rescue and the RSPCA were called to a house for assistance for a feline named Tinkerbell who’d been stuck on a roof for two days. A firefighter named Andy (but also referred to as “the cat whisperer” climbed the ladder to the roof, spoke to the frightened feline and she walked right into the carrier he put out for her. The entire rescue took about 45 minutes. Does your town have a cat whisperer? I think every town needs one! What is this madness the humans call “cosplay”? I had my purrsonal assistant look up the definition of this strange practice. It is “the practice of dressing up as a character from a movie, book, or video game, especially one from the Japanese genres of manga and anime.” Okay humans, dress up like anything you like but do you really have to bring felines into this wacky ritual? After my stringent warning to the humans about NEVER attempting to stuff me in a costume again and, after so many of my feline friends chimed in regarding my “no costume” rule I was dismayed to see so many cats in costumes! I cannot wrap my kitty head around this and would love to hear from any “cosplay kitties” as to why you enjoy this (at least you look like you’re enjoying yourself in the photos). Aaaaand, yet another human who thinks it’s a great idea to dress up his cats (at least most of these are photoshopped to save the poor felines the indignity and trauma of costumes). Now this human (who clearly has too much time on his hands) loves films so much, he’s dragged his poor kitties into his passion and recreates his favorite scenes from films. Good grief humans, can’t you go through a day without humiliating your felines??!! I long for the days in Egypt when we cats were revered like gods. Now I’ve had many folks see my photo and say things like, “Oh, he looks just like my Siamese cat!” but I’ve never heard anyone say I resemble a rabbit. But animal photographer Mark Taylor, from the UK decided to photograph look-alike felines and bunnies and I must say, I think he nailed it! Purrrruse the photos and see if you can find a bunny that resembles your feline visage. Scott Sommerdorf | The Salt Lake Tribune) Melissa Davis, left and Jackie Rogers play and pet cats at Tinker’s Cat Cafe. I am a fan of cat cafes and am always excited to hear about new ones. And I’m purring with delight to know that the trend is getting closer to our Idaho home! Tinkers Cat Cafe sounds like a wonderful place and it, as most of the cat cafes we’ve featured, was inspired by the feline cafes in Japan. The cafe has a cat side and a food side with delicious food and drinks brought in from local establishments . The Cafe owner says they carry the best bagels in town from Ditta Cafe, cool cat-shaped cookies from Les Madelines and they also offer vegan and gluten-free options. 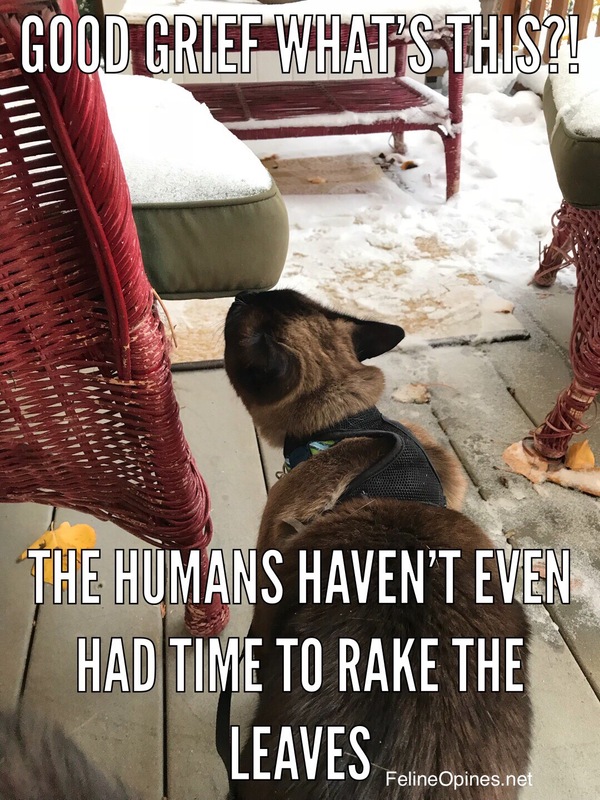 The goal is to keep the humans and the cats happy. All the cats are available for adoption. There are no kittens there as kittens adopt quickly. Two paws up for Tinkers Cat Cafe. 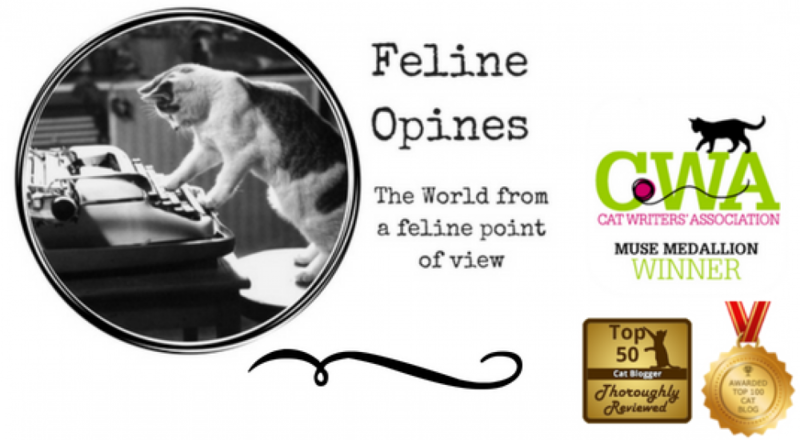 I’d love to hear from any of my readers who’ve visited a cat cafe, drop me a line and tell me about your experience. 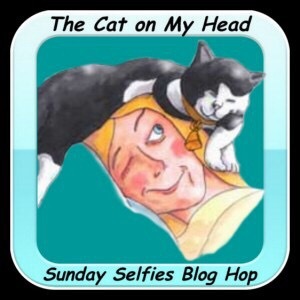 I hopped over to The Cat On My Head blog to share this selfie, you should head on over there and post yours! Alberto here, a happy adoptee from Panhandle Animal Shelter. Please think about what you could do for your local shelter. Most shelters have wish lists. 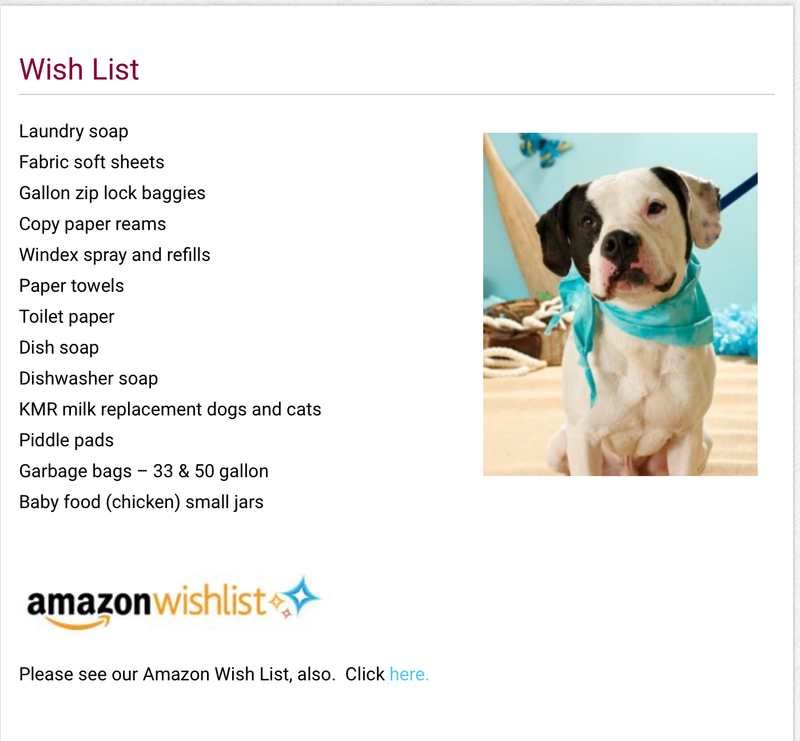 Do you know what’s on your shelters wish list? It would be great if you could help them out! 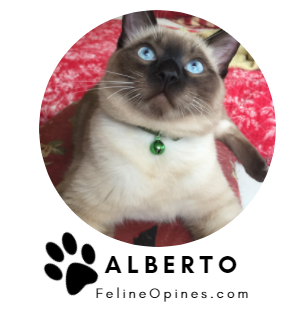 Alberto here for my weekly purrrusal of all things feline on the web. Enjoy! Finally New York is getting wise to the idea that cats rule! They’ve had a Dog Film Festival for the last three years and this has really gotten my whiskers in a twist. Well thank goodness, someone got a clue and the FIRST Cat Film Festival will be held in New York at the Chelsea SVA Theater in December! And all I can say is, “It’s about time!” If you want to learn more you can watch a promo for the event here. My human attends a conference for pet writers and bloggers called BlogPaws and at this conference, she learned about pets of domestic abuse survivors. Did you know that often, people in abusive situations have to choose between their safety and their pet? Did you know that in most shelters, domestic abuse survivors cannot take their pets because there is no place for the animals? How sad to force someone to part with the one thing that offers them unconditional love! The Pet and Women Safety Act (PAWS Act, for short) is attempting to amend the federal criminal code to broaden the definition of stalking to include the reasonable fear of death or serious bodily injury to a person’s pet. Additionally, it would expand interstate violations of a protection order to also cover pets. Lastly, it directs the Department of Agriculture to award grants for shelter, housing assistance, and support services for survivors of domestic violence with pets. This is a law The Tribe of Five can wholeheartedly support and we hope you will sign the petition and support it too. And how about checking with your local shelter and finding out if they have resources for the pets of domestic violence survivors? The only kind of purrlitical stuff I’m interested in is the feline variety. For instance, I was Oliver’s campaign manager when he ran for Purresident with the Kitty Kat Party last year. Evidently, there are purrlitical felines in the UK as well and they were vying for the title of Purr Minister. The 2017 Purr Minister campaign ended last week. There were six moggies who competed for the Purr Minister crown and each wrote a Manifursto explaining why they deserved to be voted the most fabulous feline in Westminster. The winner was selected by the public and it was a hotly contested race. This year’s winner, garnered 49 percent of the public vote. Two paws up for the new Purr Minister, Midnight! Image Credit: Caitlin Unsell Follow the sign to Capitol Hill’s new kitty den. Those cool cats in Seattle always seem to be on the cutting edge of hipness. Case in point, the Neko Cat Cafe that serves beer and snacks! The owner and founder of this cat cafe, Caitlin Unsell, was inspired by the cat cafes in Japan. Neko is the third cat cafe in the Seattle area but the felines you meet at the Neko cafe are extra special. Unsell partnered with Regional Animal Services of King County to help the cafe kitties find furever homes. All of the cats Neko (which means “cat” in Japanese) are diagnosed with the feline leukemia virus which is a disease that poses long term health issues but does not keep the cats from living long, happy lives. People often pass over cats with health issues in shelters and Unsell hopes to change this by giving the cat loving community a chance to meet and know the felines at her cafe. The cafe has two areas, one for the cafe and the other for the cats. The happy felines have a long bank of windows at pavement level for great canine and human viewing. I am overwhelmed when I realize how many great humans there are out there who are not just dedicating themselves to finding furever homes for felines but finding homes for felines that are usually passed over for adoption. Two paws up for the Neko Cat Cafe.